I really like writing Erik. Dude has no idea how he comes off to people. THERE'S GOING TO BE BIG NEWS TONIGHT! Please come check out either this site or the EverydayAbnormal Facebook page tonight or at least sometime this weekend, as I've got a big announcement or two to give. Want to help support EverydayAbnormal? I am now offering commission work! I'm offering the best quality of art that I can manage. I want to make that piece of art you've always wanted to see, that bonus art that you've wanted to give your readers, that cover for your book, that desktop image to make your computer look awesome... whatever it is. I want to create unique, one-of-a-kind art for you. Color art for $40: In the style of this or this! I'm also available for graphic design (such as logos and layouts) and comic pages. If you're interested, we'll negotiate some numbers based on what you're looking for. I hope you take advantage of this! I'm excited to be working for you. If you're interested in commissioning a piece, private message me at ComicFury by clicking my username link, or private message me through the EverydayAbnormal Facebook page! Thank you very much for reading (both the comic and this little pitch)! If it's a Kickstarter, I'll try and figure out where to get some money. It is not, but it is close! Oooh, big news? :o Good thing I check ComicFury on a regular basis! 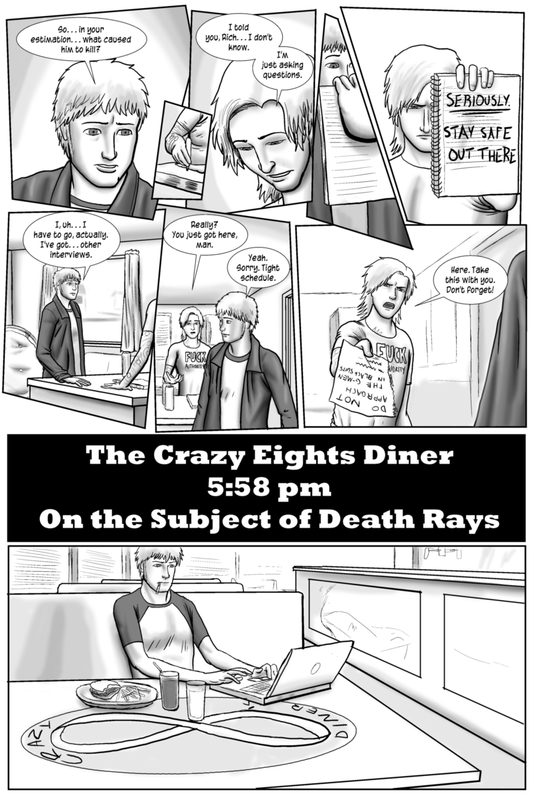 Also, I find it strangely amusing that right after talking to a guy who appears to be "crazy", Rich goes to a place called "Crazy Eights Diner". I would say... yeah, that will do just fine. Funny, I just saw a G-man in a black suit.. should I be worried?